A dye is a coloured compound,normally used in solution,which is capable of being fixed to a fabric. The dye must be ‘fast’or chemically stable so that the colour will not wash with soap and water, fade on exposure to sunlight etc. Dyeing is normally done in a special solution containing dyes and particular chemical material. After dyeing, dye molecules have uncut Chemical bond with fiber molecules. The temperature and time controlling are two key factors in dyeing. Natural dyes are simply dye substances extracted from natural sources. Although the main source of dyes for early times, they have largely been replaced by synthetic dyes, which are usually more reliable, cheaper and can be supplied more readily. Natural dyes still in use include haematoxylin, carmine, orcein. Colouring materials have been used for many thousands of years by man. Leather, cloth, food, pottery and housing have all been modified in this way. Some of our most common dyes are still derived from natural sources. These are termed natural dyes. The Colour Index uses this as a classification and naming system. Natural dyes are often negatively charged. Positively charged natural dyes do exist, but are not common. In other words, the coloured part of the molecule is usually the anion. Although the molecular charge is often shown on a specific atom in structural formulae, it is the whole molecule that is charged. Many, but by no means all, natural dyes require the use of a mordant. Dyes derived from organic or inorganic compound are known as synthetic dyes. 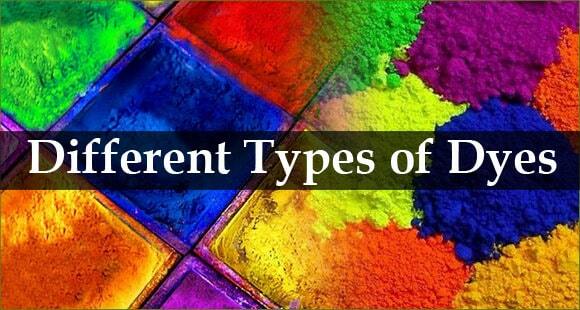 Examples of this class of dyes are Direct, Acid, Basic, Reactive, Mordant, Metal complex, Vat, Sulphure , Disperse dye etc. Synthetic dyes quickly replaced the traditional natural dyes. They cost less, they offered a vast range of new colors, and they imparted better properties to the dyed materials dyes are now classified according to how they are used in the dyeing process. Acid dyes are water-soluble anionic dyes, containing one or more sulfonic acid substituents or other acidic groups. An example of the class is Acid Yellow 36. This group was the first of the synthetic dyes to be taken out of coal-tar derivatives. As textile dyes, they have been largely replaced by later developments.They are still used in discharge printing, and for preparing leather, paper, wood, and straw. More recently they have been successfully used with some readymade fibers, especially the acrylics. Basic dyes were originally used to color wool, silk, linen, hemp, etc., without the use of a mordant, or using agent. 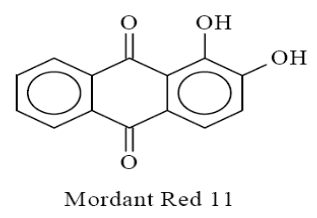 With a mordant like tannic acid they were used on cotton and rayon. Basic dyes give brilliant colors with exceptional fastness to acrylic fibers. They can be used on basic dyeable variants of nylon and polyester. Basic Brown 1 is an example of a cationic dye that is readily protonated under the pH 2 to 5 conditions of dyeing. These are the dyes which can be applied directly to the fabrics from an aqueous solution. These are most useful for fabrics which can form hydrogen bonds with the Dyeing of Fabrics. The direct dyes mainly the basic dyes and were widely hailed because they made it unnecessary to use a mordant or binder in dyeing cotton. The colors are not as brilliant as those in the basic dyes but they have better fastness to light and washing, and such fastness can be measurably improved by after treatments (diazotized and developed.) Direct dyes can be used on cotton, linen, rayon, wool, silk and nylon. 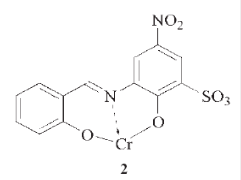 These dyes usually have azo linkage –N=N- and high molecular weight. They are water soluble because of sulfonic acid groups. 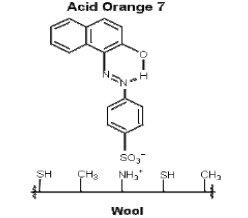 Direct orange 26 is a typical direct dye. Azo dyes contain at least one azo group (-N=N-) attached to one or often two aromatic rings. These dyes are used primarily for bright red shades in dyeing and printing since most other classes of fast dyes are lacking in good red dyes. Azoic dyes, called Naphthols in the industry, are actually manufactured in the fabric by applying one half of the dye. The other half is then put on and they combine to form the finished color. Unless they are carefully applied and well washed, they have poor fastness to rubbing or crocking. The production of bluish red azoic dye from the following two components is an example. 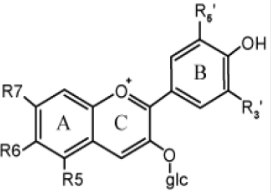 Nitro dyes are polynitro derivatives of phenols containing at least one nitro group ortho or para to the hydroxyl group.It is used to dye wool.It Consist of two or more aromatic rings (benzene, naphthalene). Disperse dyes were originally developed for dyeing secondary cellulose acetate fibers. These dyes are relatively insoluble in water and are prepared for dyeing by being ground into relatively fine powder in the presence of dispersing agents. In the dye bath, a suspension of the dye particle dispersion produces a very dilute solution of the dyes, which are then absorbed by the fibers. This dye class is used to dye polyester, nylon, acetate and triacetate fibers. Disperse yellow 3, Disperse Red 4, and Disperse Blue 27 are good examples of disperse dyes. The vat dyes are insoluble complex polycyclic molecules based on the quinone structure (ketoforms). The term vat comes from the old indigo method dyeing in a vat: indigo had to be reduced to light form. Vat dyes are made from indigo, anthraquinone and carbazole. They are successfully used on cotton, linen, rayon, wool, silk, and sometimes nylon. Vat dyes are also used in the continuous piece of dyeing process sometimes called the pigment application process. The dyeings produced in this way have high wash and light fastness. 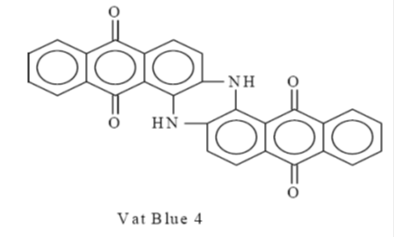 An example of a vat dye is Vat Blue 4 (Indanthrene). These Dyeing of Fabrics do not dye the fabric directly but require a binding agent known as mordant. The mordant acts as a binding agent between the fibre and the dye. Some dyes combine with metal salts (mordanting) to form insoluble colored complexes (lakes). These materials are usually used for the dyeing of cotton, wool or other protein fiber. The metallic precipitate is formed in the fiber producing very fast colors highly resistant to both light and washing. These dyes react with the cellulosic fiber to form a covalent bond. This produces dyed fiber with extremely high wash fastness properties. These are the dyeing of fabrics which contain a reactive group which combines directly with the hydroxyl or the amino group of the fibre. Because of the chemical reaction the colour is fast and has a very long life. Cotton, wool or silk can be dyed with this type of dyeing of Fabrics. These dyes are water-insoluble but soluble in alcohols, chlorinated hydrocarbons, or liquid ammonia. These colours are applied by dissolving in the target, which is invariably a lipid or non-polar solvent. The Colour Index uses this as a classification and naming system. Each dye is named according to the pattern: – solvent + base colour + number They are used for coloring synthetics, plastics, gasoline, oils and waxes. The sulphur dyes provide very deep shades, which have excellent resistance to washing but poor resistance to sunlight. They will dye cotton, linen, and rayon, but not brightly. A problem with sulphur dyes especially the black colors is that they make the fabric tender, or weaken its structure, so that it breaks easily. Sulfur dyes are applied to cotton from an alkaline reducing bath with sodium sulfide as the reducing agent. They are low cost and have good fastness to light, washings and acids. These dyes are economical dyes and are generally used to produce dark shades such as dark greens , dark blues and blacks. These dyes have good leveling and color fastness properties. The interaction between fiber and dye is established through very strong ionic bonds , which are formed between the anionic groups of the colorant and ammonium cations on the fiber. Chromium or the metal ion acts as bridge between the dye and fiber , which gives rise to a very strong linkage , resulting into excellent fastness properties. At last said that dye is very important for Textile sector. Because the fabric are to make attractive to us by dyeing. Dyes that are used by the Textile industry are now mostly synthetic. These dyes are marketed power sgranules and liquid dispersion. Now the industrial Textile dyes must rise up to meet all these new and specific technical reguirements.